This name uses Spanish naming customs: the first or paternal family name is Ramírez and the second or maternal family name is Pereyra. Gastón Exequiel Ramírez Pereyra (locally [ɡahˈton raˈmiɾes]; born 2 December 1990) is a Uruguayan footballer who plays as an attacking midfielder for Italian club Sampdoria and the Uruguay national team. He had spells in Uruguay with Peñarol and in Italy with Bologna before moving into the Premier League to Southampton. During his time with Southampton, he spent one season on loan to Hull City in the 2014–15 season in the same division, and the first half of the 2016–17 season with Middlesbrough before joining them permanently for one season before moving back to Italy. Since 2010, he has been playing for the Uruguayan national team, representing them at the 2012 Olympics, 2013 Confederations Cup and 2014 World Cup. Born in Fray Bentos, Uruguay, Ramírez moved to the capital city Montevideo to join Peñarol when he was sixteen. He made his professional debut for the club at age 18, in a 1–0 loss against Defensor Sporting on 21 March 2009. His second year there proved to be a breakthrough season for Ramírez, as he was given a handful of first team appearances. Despite being absent from the Torneo Apertura campaign due to international commitments, Ramírez scored his first Peñarol goal in a 5–0 win over Atenas on 13 December 2009. In the Torneo Clausura, Ramírez scored again and set up a goal in a 2–1 win over Cerro on 30 January 2010. Ramírez scored four more goals against Liverpool, Rampla Juniors, Defensor Sporting and Danubio. Ramírez went on to score six goals in 30 games, helping the club win the 2009–10 Primera División. Ramírez's performance at Peñarol attracted interest from European clubs, such as Schalke 04 and Bologna. On 25 August 2010, Ramírez was sold to Serie A side Bologna for €2.5 million. 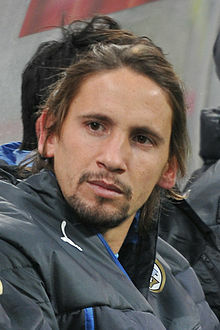 Ramírez made his Bologna debut in a 1–1 draw away to Catania on 26 September 2010 as a substitute for Diego Pérez in the 76th minute. A month later, on 27 October 2010, Ramírez scored his first goals for the club in a 3–2 win over Modena in the third round of the Italian Cup. He scored again in the fourth round of the Italian Cup and assisted with another goal in a 3–1 win over Cagliari. He did not score his first Serie A goal for the club until 23 January 2011, in a 3–1 win over Lazio. After suffering an injury, Ramírez scored three more goals in the season against Cagliari, Leece and Fiorentina (where he was sent off after a second bookable offence). Ramírez finished his first season at Bologna with four goals and two assists in 25 league appearances, and scored three goals in two Coppa Italia games. Ahead of the 2011–12 season, Ramírez was linked with Premier League side Manchester City and Inter Milan. He expressed his desire to leave the club but was urged to stay at the club by his then-teammate Marco Di Vaio, which he did. After suffering from an injury, Ramírez returned to the next game on 16 October 2011 and scored his first goal of the season, in a 2–0 win over Novara. Ramírez scored three more goals by the end of the year against Atalanta, Palermo and Genoa. His good performance at Bologna earned him a new contract, keeping him until 2016. Despite suffering from an ankle injury, Ramírez scored four more goals later in the 2011–12 season against Fiorentina, Milan, Genoa and Catania. He finished the 2011–12 season, making 33 appearances and scoring eight times in all competitions. Despite signing a contract during the 2011–12 season, Ramírez continued to be in the transfer speculation, such as Napoli, Inter Milan and Juventus. In response to this, the club offered him a new contract once more. In late-August, Ramírez was linked with a move to Southampton and was on the verge of being signed for a reported £12 million. However, the deal was angrily denied by the club's management. With the deal appearing to be stalled, and with his agent stating that the move was bound to fail, it was unexpectedly agreed on 27 August 2012. On 31 August 2012, Ramírez joined Southampton for a reported £12 million, signing a four-year contract. He made his debut on 15 September in a 6–1 defeat against Arsenal, coming on as a half-time substitute for Steven Davis. He scored his first goal two weeks later on 29 September 2012, opening the scoring in a 3–1 defeat against Everton. After suffering from a hamstring injury, he returned to the first team, where he played 76 minutes, in a 2–0 loss against West Brom on 5 November 2012. His first home goal came in a 2–0 victory against Newcastle United on 25 November, as well as setting up the other goal. On 1 January 2013, he scored in a 1–1 draw at home to Arsenal. After suffering a leg injury, Ramírez went on to score two more goals later in the season on 2 March 2013, in a 2–1 loss against Queens Park Rangers. and another on 13 April 2013, in a 1–1 draw against West Ham United. However, on 27 April, Ramírez was sent off for an incident involving West Bromwich Albion's Marc-Antoine Fortuné following an elbow on Shane Long. As a result, he was suspended for the last three matches of the season. Ramírez finished his first season at Southampton making twenty-two appearances and scoring five times. Ahead of the 2013–14 season, Ramírez was linked with a move to clubs around Europe, such as Atlético Madrid and Borussia Dortmund for around 15 million euros. However, Southampton ruled out selling Ramírez and were prepared to reject any bid for him. Ramírez eventually stayed at the club but by the second half of the season, he was featured less in the first team. Despite this, Ramírez scored two goals in the Football League Trophy against Barnsley and Bristol City. Ramírez then scored his first league goal of the season, in a 2–1 loss against Everton on 29 December 2013. However, on 23 January 2014, it was announced that along with Dejan Lovren, Ramírez would be out for six to eight weeks with ankle ligament damage. After being sidelined for six weeks, Ramírez made his return to the first team on 22 February 2014, coming on as a substitute in the 63rd minute, in a 3–1 loss against West Ham United. He finished the 2013–14 season with 18 appearances and scoring once for the club. Although he made one appearance in the 2014–15 season, in a 3–1 win against West Ham United on 30 August 2014, newly appointed manager Ronald Koeman was keen on using him in the first team, due to his playing style, and expressed reluctance to let him leave the club. After his loan spell at Hull City came to an end, Ramírez was told by manager Koeman he had no future at the club. In response to this, he showed that he wanted to leave Southampton by ripping up his contract in an attempt to return to Uruguay. Despite this, he made his first appearance for the club in a year, coming on as a substitute in a 6–0 win over Milton Keynes Dons in the second round of the League Cup. After the match, Manager Koeman praised Ramírez after he showed signs of an improvement in his discipline. A month later on 25 October 2015, Ramírez made his first league appearance for the club, where he provided an assist for Sadio Mané, in a 1–1 draw against Liverpool. In the January transfer window, however, Koeman told him that he could leave the club and he subsequently joined Middlesbrough. He went on to make three appearance for Southampton in the 2015–16 season. At the end of the season, Ramírez was among four players to be released by the club. The Southern Daily Echo reported that Southampton made a £21 million loss on Ramírez and that he had cost them £8000 a minute. After being released by Southampton, he reportedly returned to Uruguay, re-joining Peñarol, due to contractual complications. On 1 September 2014, Ramírez was loaned to fellow Premier League club, Hull City. Ramírez stated that he had joined the club to show Hull City's supporters what he can do. Two weeks later he made his debut at the KC Stadium, replacing fellow debutant Mohamed Diamé for the final 11 minutes of a 2–2 draw against West Ham United. Ramírez was given a straight red card for kicking Tottenham Hotspur's Jan Vertonghen in Hull's 1–2 home defeat on 23 November. He scored once in 22 games for the Tigers – equalising in a 3–1 win at Sunderland on 26 December with a 30–yard strike, before assisting James Chester's header via a corner kick. Ramírez then provided an assist for David Meyler to score Hull City's only goal in a 1–1 draw against Manchester City on 7 February 2015. However, as the 2014–15 season progressed, Ramírez suffered two injuries and Hull City were relegated at the end of the season. On 26 January 2016, Ramírez joined Championship side Middlesbrough on loan until the end of the season, when his Southampton contract was due to expire. He made his debut on 9 February in a 1–1 draw at MK Dons, and two weeks later he scored his first Boro goal, giving them the lead in a 3–1 win against Cardiff City at the Riverside Stadium. On 4 March, he struck both goals in a 2–1 home win over Wolverhampton Wanderers, putting his team on top of the Championship table. Ramírez went on to score four more goals against Queens Park Rangers, a brace against Huddersfield Town and Birmingham City. On 7 May, he was part of the Middlesbrough side that won promotion to the Premier League with a man of the match performance in a 1–1 draw with Brighton & Hove Albion, despite sustaining an injury following a challenge by Dale Stephens. After leaving Southampton, Ramírez re-joined Middlesbrough, signing a three-year contract on 22 July 2016. Upon joining the club, he stated that it was the club's supporters, who played a role in his return to the club. Ramírez's first game after signing for the club on a permanent basis came in the opening game of the season, where he set up a goal for Álvaro Negredo to put the hosts ahead in a 1–1 home draw against Stoke City. After reappearing for the side on a permanent basis, Ramírez continued to establish himself in the first team, pushing out Stewart Downing. However, he faced criticism over "his alarming loss of form" in a number of matches. He scored his first goal for the side on 29 October 2016, in a 2–0 win over Bournemouth. The goal won BBC Goal of the Month in October. After serving a suspension for receiving a yellow card during the match against Bournemouth, Ramírez then scored against his former club, Hull City, in a 1–0 win on 5 December 2016. In the January transfer window, Leicester City had a bid rejected for Ramírez by the club, leading him to go on a transfer request. But after the transfer window was closed by the end of January, the club managed to keep him. However, as the 2016–17 season began, Ramírez found himself out of the first team with injuries, suspension, competitions and Aitor Karanka's sacking. Following Middlesbrough's relegation in the Premier League at the end of the 2016–17 season, Ramírez made a total of 26 appearances, scoring twice. Ahead of the 2017–18 season, Ramírez was linked with a possible move away from the club to Benfica and Real Betis among interested. Amid Ramírez's uncertain future, manager Garry Monk called him up in the club's pre-season tour and featured him in the friendly match against Oxford United. Although Monk praised Ramírez' return, his appearance against Augsburg on 29 July 2017 resulted in boos and jeers from Middlesbrough supporters, leading to accusations from a Gazette Live journalist of double standards. By the time of his departure, Ramírez became the third Uruguayan player to leave Middlesbrough following the departure of his compatriot Carlos de Pena and Cristhian Stuani. On 4 August 2017, Ramírez joined Serie A side Sampdoria for a fee of £9.85 million. It came after Middlesbrough received no bids for his services and his contract contained no clause allowing him to approach clubs. Reflecting on playing in England he said:"I've been five years in the Premier League (previously at Southampton and Hull), I grew up playing with strong players. I played the World Cup, Copa America, now I've improved and completed. I have the right experience to take on my responsibilities and give the team what is missing in an important moment for my career." Ramírez made his Sampdoria debut in the opening game of the season, where he set up a goal for Fabio Quagliarella. In 2009, Ramírez played in the FIFA U-20 World Cup. On 8 October 2010, he received his first full cap for Uruguay in a 7–1 friendly win against Indonesia in Jakarta, replacing Diego Pérez at half time. In July 2012, he was named in the Uruguay squad for the football tournament at the 2012 Summer Olympics, scoring during a warm-up match against Panama on 15 July. On 26 July, he scored from a free-kick to equalise as Uruguay won 2–1 against the United Arab Emirates at Old Trafford in their opening game, although they were eventually eliminated at the group stage. In June 2013, Ramírez was picked by Óscar Tabárez for the 2013 FIFA Confederations Cup tournament. Ramírez started the first group game against world champions Spain, and the third match against Tahiti, as Uruguay eventually came fourth. On 31 May 2014, Ramírez was named in Uruguay's squad for the 2014 FIFA World Cup. He made his tournament debut in the last group game against Italy on 24 June, replacing Cristian Rodríguez after 78 minutes. Three minutes later he supplied the cross from which Diego Godín scored the only goal of the game, putting Uruguay through to the knock-out stages. After missing the Copa América due to a hamstring injury, Ramírez played his first game for Uruguay in a year in a 3–1 win over Trinidad and Tobago and was included in the Copa América Centenario squad, where he played all three matches. He was named in the squad for the China Cup in March 2018. In May 2018 he was named in Uruguay's provisional 26 man squad for the 2018 World Cup in Russia. Ramírez married Micaela Duarte in the summer of 2012. In early 2016 he became a father when his wife gave birth to a daughter. Upon moving to England, Ramírez said he was taking English lessons as part of his work permit requirements. ^ "Barclays Premier League Player Profile Gastón Ramírez". Premier League. 2014. Retrieved 6 November 2014. ^ a b "Gaston Ramirez on WhatsApp messages with Luis Suarez, love of barbecues and life at Middlesbrough". Gazette Live. 29 October 2016. Retrieved 10 September 2017. ^ "Defensor vence 1–0 a Peñarol y toma distancia en la cima del Clausura uruguayo" (in Spanish). El Tiempo. 21 March 2009. Retrieved 6 October 2016. ^ a b "ROMÁN FUE PRESENTADO EN PEÑAROL La séptima" (in Spanish). Spanish. 4 September 2009. Retrieved 6 October 2016. ^ "PEÑAROL GOLEÓ A ATENAS EN MALDONADO Puente aéreo" (in Spanish). Futbol.com. 13 December 2009. Retrieved 6 October 2016. ^ "PEÑAROL Y LIVERPOOL PRIMEROS Se rayó la punta" (in Spanish). Futbol.com. 2 February 2010. Retrieved 6 October 2016. ^ "TODA LA FECHA Se aleja y se arrima" (in Spanish). Futbol.com. 22 February 2010. Retrieved 6 October 2016. ^ "9ª FECHA DEL TORNEO CLAUSURA Nueve sobre mojado" (in Spanish). Futbol.com. 22 March 2010. Retrieved 6 October 2016. ^ "DEFENSOR SPORTING-PEÑAROL A LAS 16 Mucho más que tres puntos" (in Spanish). Futbol.com. 28 March 2010. Retrieved 6 October 2016. ^ "14ª FECHA DEL TORNEO CLAUSURA Las copas para el final" (in Spanish). Futbol.com. 26 April 2010. Retrieved 6 October 2016. ^ "RAMÍREZ PRETENDIDO EN ALEMANIA Rumores van, rumores vienen" (in Spanish). Futbol.com. 31 March 2010. Retrieved 6 October 2016. ^ "DIEGO PÉREZ CERCA DE BOLOGNA Ruso a la bolognesa" (in Spanish). Futbol.com. 26 July 2010. Retrieved 6 October 2016. ^ "Scegli la squadra – Tutti i trasferimenti" (in Italian). Legia Serie A. 25 August 2010. Archived from the original on 17 July 2015. Retrieved 6 October 2016. ^ "UFFICIALE: doppio colpo del Bologna, ecco Ramirez e Tine" (in Italian). Tutto Mercato Web. 26 August 2010. Retrieved 6 October 2016. ^ "FÚTBOL ITALIANO Se viene la celeste" (in Italian). Futbol.com. 26 September 2010. Retrieved 6 October 2016. ^ "Il Bologna dice grazie a Ramirez" (in Italian). La Gazetta Dello Sport. 28 October 2010. Retrieved 6 October 2016. ^ "Bologna, una lezione in tre gol Il Cagliari travolto ed eliminato" (in Italian). La Gazetta Dello Sport. 26 November 2010. Retrieved 6 October 2016. ^ "GOLES URUGUAYOS EN ITALIA La legión uruguaya" (in Italian). Futbol.com. 23 January 2011. Retrieved 6 October 2016. ^ "RAMÍREZ: BAJA ENTRE DOS Y CUATRO SEMANAS Bautismo italiano" (in Italian). Futbol.com. 25 January 2011. Retrieved 6 October 2016. ^ "Braida in tribuna a Bologna spia Astori e Della Rocca" (in Italian). Le Gazzetta Dello Sport. 7 March 2011. Retrieved 6 October 2016. ^ "Ha segnato Ramirez e qualcuno non-lo sa" (in Italian). La Fa. 14 March 2011. Retrieved 6 October 2016. ^ "GOLES URUGUAYOS EN EL EXTERIOR Bien Gastón, mal Gastón" (in Spanish). Futbol.com. 15 May 2011. Retrieved 6 October 2016. ^ "Bologna Squad Archive". Who Scored. Retrieved 8 November 2011. ^ "Bologna, il City vuole Ramirez Offerta vicina ai 20 milioni" (in Italian). La Gazzetta Dello Sport. 13 April 2011. Retrieved 6 October 2016. ^ "Ramirez è in rotta E l'Inter ci prova" (in Italian). La Gazzetta Dello Sport. 30 April 2011. Retrieved 6 October 2016. ^ "Per Gaston si aspettano compratori" (in Italian). La Gazzetta Dello Sport. 9 August 2011. Retrieved 6 October 2016. ^ "Di Vaio chiama Ramirez: "Restare gli farebbe bene"" (in Italian). La Gazzetta Dello Sport. 9 August 2011. Retrieved 6 October 2016. ^ "Joyas en alza" (in Italian). Futbol.com. 2 October 2011. Retrieved 6 October 2016. ^ "GOLES URUGUAYOS EN EL EXTERIOR Los flacos al ataque" (in Spanish). Futbol.com. 16 October 2011. Retrieved 6 October 2016. ^ "ITALIA: JUVENTUS GANÓ Y LIDERA Vecchia y puntera" (in Italian). Futbol.com. 30 October 2011. Retrieved 6 October 2016. ^ "Stravince il Palermo. E' 3 a 1 sul Bologna dell'ex Pioli" (in Italian). Sky Italia. 5 November 2011. Retrieved 6 October 2016. ^ "Spettacolo a MarassiIl Genoa la spunta sul Bologna" (in Italian). La Gazzetta Dello Sport. 18 December 2011. Retrieved 6 October 2016. ^ "UFFICIALE: Bologna, rinnova Ramirez" (in Italian). Tutto Mercato Web. 5 November 2011. Retrieved 6 October 2016. ^ "Ramirez, pericolo scongiurato Il Bologna pesca il jolly Kone" (in Italian). La Gazzetta Dello Sport. 23 March 2012. Retrieved 6 October 2016. ^ "PAGELLE/Bologna-Fiorentina (2–0): i voti la cronaca il cronaca il tabellino recupero ventunesima giornata" (in Italian). Ilsussidiario.net. 21 February 2012. Retrieved 6 October 2016. ^ "PAGELLE Milan Bologna 1–1 voti la cronaca il tabellino trentaquattresima giornata" (in Italian). Ilsussidiario.net. 22 April 2012. Retrieved 6 October 2016. ^ "Bologna in paradiso: Il Genoa nel dramma" (in Italian). La Gazzetta Dello Sport. 29 April 2012. Retrieved 6 October 2016. ^ "Catania-Bologna, voti e pagelle della Gazzetta dello Sport" (in Italian). Calcio Mercato News. 3 May 2012. Retrieved 6 October 2016. ^ "Napoli, offerta per Ramirez" (in Italian). Tutto Mercato Web. 10 July 2012. Retrieved 6 October 2016. ^ "Inter, pronto l'assalto decisivo a Ramirez" (in Italian). Tutto Mercato Web. 9 August 2012. Retrieved 6 October 2016. ^ "Juventus, conferme sull'idea bianconera: Ramirez e cash per Jovetic" (in Italian). Tutto Mercato Web. 19 July 2012. Retrieved 6 October 2016. ^ "Nuovi contatti per Ramirez. Se arriva Gabbiadini..." (in Italian). Le Gazzetta Dello Sport. 13 July 2012. Retrieved 6 October 2016. ^ "Uruguayan Gaston Ramirez flying to England to sign for Southampton Football Club after deal agreed with Bologna". Daily Echo. 17 August 2012. Retrieved 6 October 2016. ^ "ESCLUSIVA TMW – Ramirez-Southampton, cifre e aggiornamenti". Tutto Mercato Web. 17 August 2012. Retrieved 6 October 2016. ^ "Saints' Gaston Ramirez deal stalled again". Daily Echo. 21 August 2012. Retrieved 6 October 2016. ^ "Ramirez agent claims Saints deal is off". Daily Echo. 22 August 2012. Retrieved 6 October 2016. ^ "Saints 'agree deal' for Ramirez". Daily Echo. 27 August 2012. Retrieved 6 October 2016. ^ "Ramírez Completes Saints Switch". Southampton FC. 31 August 2012. Archived from the original on 2 September 2012. Retrieved 1 September 2012. ^ "Gaston Ramirez completes move to Southampton". BBC Sport. 31 August 2012. Retrieved 1 September 2012. ^ "Arsenal 6–1 Southampton". BBC Sport. 15 September 2012. Retrieved 29 September 2012. ^ "Everton 3–1 Southampton". BBC Sport. 29 September 2012. Retrieved 29 September 2012. ^ "Ramirez misses Fulham clash". Daily Echo. 7 October 2012. Retrieved 6 October 2016. ^ "West Bromwich Albion 2–0 Southampton". BBC Sport. 5 November 2012. Retrieved 25 November 2012. ^ "Southampton 2–0 Newcastle United". BBC Sport. 25 November 2012. Retrieved 25 November 2012. ^ "Southampton 1–1 Arsenal". BBC Sport. 1 January 2013. Retrieved 1 February 2013. ^ "Saints facing injury crisis ahead of City test". Daily Echo. 8 February 2013. Retrieved 6 October 2016. ^ "Southampton 1–2 Queens Park Rangers". BBC Sport. 2 March 2013. Retrieved 6 October 2016. ^ "West Ham United 1–1 Southampton". BBC Sport. 13 April 2013. Retrieved 6 October 2016. ^ "Saints 0 – 3 West Brom: Report". Southampton F.C. 27 April 2013. Archived from the original on 22 November 2015. Retrieved 6 June 2013. ^ "Southampton 0 – 3 West Brom". BBC Sport. 27 April 2013. Retrieved 6 June 2013. ^ "Premier League: Mauricio Pochettino backing Gaston Ramirez to come good". Sky Sports. 29 April 2013. Retrieved 6 October 2016. ^ "Gastón Ramírez pisté par des poids lourds européens" (in French). Foot Mercato. 27 June 2013. Retrieved 6 October 2016. ^ "Gastón Ramírez no se vende" (in Spanish). Ovacion Digital. 29 June 2013. Archived from the original on 9 October 2016. Retrieved 6 October 2016. ^ "Poch stays silent over Ramirez". Daily Echo. 18 October 2013. Retrieved 6 October 2016. ^ "Barnsley 1 – 5 Southampton". BBC Sport. 27 August 2013. Retrieved 6 October 2016. ^ "Southampton 2 – 0 Bristol City". BBC Sport. 25 September 2013. Retrieved 6 October 2016. ^ "Everton 2 – 1 Southampton". BBC Sport. 29 September 2013. Retrieved 6 October 2016. ^ "Gaston Ramirez and Dejan Lovren out for up to eight weeks" BBC Sport. 23 January 2014. Retrieved 23 January 2014. ^ "Volvió Gastón" (in Spanish). Ovacion Digital. 22 February 2014. Archived from the original on 6 October 2016. Retrieved 6 October 2016. ^ "West Ham United 3 – 1 Southampton". BBC Sport. 30 August 2014. Retrieved 6 October 2016. ^ "Ron sees Gaston as Saints' creative force". Daily Echo. 29 August 2014. Retrieved 6 October 2016. ^ "Emmanuel Mayuka has no future at Southampton while Gaston Ramirez is also struggling". Daily Echo. 30 July 2015. Retrieved 6 October 2016. ^ "Southampton reject Gaston Ramirez in talks to rip up his contract to return to Uruguay". Daily Mirror. 11 September 2015. Retrieved 6 October 2016. ^ "Milton Keynes Dons 0 – 6 Southampton". BBC Sport. 24 September 2015. Retrieved 6 October 2016. ^ "Gaston Ramirez has another chance to prove himself at Southampton". Daily Echo. 25 September 2016. Retrieved 6 October 2016. ^ "Liverpool 1 – 1 Southampton". BBC Sport. 25 October 2015. Retrieved 6 October 2016. ^ "Ramirez has no future at Southampton – Koeman". Four Four Two. 16 January 2016. Retrieved 6 October 2016. ^ "Southampton release Gaston Ramirez but Kelvin Davis may stay". Sky Sports. 26 May 2016. Retrieved 6 October 2016. ^ "Gaston Ramirez has cost Southampton FC £8,000 a minute". Daily Echo. 7 January 2016. Retrieved 6 October 2016. ^ "Boro pull out of the chase to sign Gaston Ramirez due to contractual complications". Gazette Live. 30 May 2016. Retrieved 10 September 2017. ^ "Transfer deadline day: Hull sign Gaston Ramirez and Mo Diame". BBC Sport. 1 September 2014. Retrieved 1 September 2014. ^ "Ramirez Wants To Show Hull City Fans What He Can Do". Hull City A.F.C. 3 September 2014. Archived from the original on 6 October 2016. Retrieved 6 October 2016. ^ "Hull 2–2 West Ham". BBC Sport. 15 September 2014. Retrieved 15 September 2014. ^ Cryer, Andy (23 November 2014). "Hull 1–2 Tottenham". BBC Sport. Retrieved 23 November 2014. ^ Mellor, Jason (26 December 2014). "Sunderland 1–3 Hull City". BBC Sport. Retrieved 5 March 2016. ^ "Manchester City 1–1 Hull City". BBC Sport. 7 February 2015. Retrieved 6 October 2016. ^ "Team News". Hull City A.F.C. 10 April 2015. Archived from the original on 6 October 2016. Retrieved 6 October 2016. ^ a b "Injury Update: Ramirez Ruled Out & Diame Has Surgery". Hull City A.F.C. 12 May 2015. Archived from the original on 6 October 2016. Retrieved 6 October 2016. ^ "Ramírez joins Boro on loan". Southampton FC. 26 January 2016. Archived from the original on 22 March 2016. Retrieved 26 January 2016. ^ "Middlesbrough: Gaston Ramirez signs on loan from Southampton". BBC Sport. 26 January 2016. Retrieved 26 January 2016. ^ "Middlesbrough 3–1 Cardiff City". BBC Sport. 23 February 2016. Retrieved 5 March 2016. ^ Aloia, Andrew (4 March 2016). "Middlesbrough 2–1 Wolverhampton Wanderers". BBC Sport. Retrieved 5 March 2016. ^ "Queens Park Rangers 2–3 Middlesbrough: Boro up to second in Championship". Sky Sports. 2 April 2016. Retrieved 6 October 2016. ^ "Middlesbrough 3–0 Huddersfield: Boro power past Huddersfield". Sky Sports. 5 April 2016. Retrieved 6 October 2016. ^ "Birmingham 2–2 Middlesbrough: Boro's promotion hopes dented". Sky Sports. 30 April 2016. Retrieved 6 October 2016. ^ Tallentire, Philip (7 May 2016). "'Gaston Ramirez played like a man possessed': Player ratings as Middlesbrough FC draw with Brighton to reach Premier League". Middlesbrough Gazette. Retrieved 10 May 2016. Gaston Ramirez 10/10: Boro's catalyst played like a man possessed. ^ Arrowsmith, Richard (7 May 2016). "Middlesbrough promotion celebrations are dampened by gruesome injury to Gaston Ramirez after Dale Stephens tackle". Daily Mail. Retrieved 10 May 2016. ^ "Gaston Ramirez joins Middlesbrough on three-year deal". Sky Sports. 22 July 2016. Retrieved 6 October 2016. ^ "Gaston Ramirez: Boro Fans Played A Big Part In My Teesside Return". Middlesbrough F.C. 22 July 2016. Archived from the original on 17 August 2016. Retrieved 22 July 2016. ^ "Middlesbrough 1–1 Stoke City". BBC Sport. 13 August 2016. Retrieved 6 October 2016. ^ "Stewart Downing makes a decision on his Middlesbrough future". Gazette Live. 19 January 2017. Retrieved 10 September 2017. ^ "'Gaston Ramirez has to do better – or risk losing his Middlesbrough starting place'". Gazette Live. 13 October 2016. Retrieved 10 September 2017. ^ "Middlesbrough 2 – 0 AFC Bournemouth". BBC Sport. 29 October 2016. Retrieved 10 September 2017. ^ "Gaston Ramirez wins Match of the Day Goal of the Month award". Gazette Live. 7 November 2016. Retrieved 10 September 2017. ^ "Manchester City vs Middlesbrough: How can Aitor Karanka replace Gaston Ramirez?". Gazette Live. 1 November 2016. Retrieved 10 September 2017. ^ "Middlesbrough 1–0 Hull City: Gaston Ramirez strike sees off lacklustre Hull City". Sky Sports. 5 December 2016. Retrieved 10 September 2017. ^ "Gaston Ramirez submits Middlesbrough transfer request – but Aitor Karanka hopes he stays". Gazette Live. 26 January 2017. Retrieved 10 September 2017. ^ "Middlesbrough's best piece of January transfer business was keeping hold of Gaston Ramirez". Gazette Live. 2 February 2017. Retrieved 10 September 2017. ^ "Aitor Karanka explains Boro injury worries over Gaston Ramirez, Alvaro Negredo and Jordan Rhodes". Gazette Live. 9 December 2016. Retrieved 10 September 2017. ^ "Middlesbrough vs Burnley TV details: What time is kick-off? Who's in the teams?". Gazette Live. 8 April 2017. Retrieved 10 September 2017. ^ "'He didn't really make much contact, it was harsh': Bournemouth's Marc Pugh on Ramirez red". Gazette Live. 22 April 2017. Retrieved 10 September 2017. ^ "Gaston Ramirez's absence barely got a mention – and we may not see him again". Gazette Live. 2 May 2017. Retrieved 10 September 2017. ^ "Middlesbrough caretaker Steve Agnew explains why 'talented' Gaston Ramirez will remain a vital first-team member". Gazette Live. 18 March 2017. Retrieved 10 September 2017. ^ "ESCLUSIVA TMW – Benfica, tentativo per Gaston Ramirez" (in Italian). Tutto Mercato Web. 26 May 2017. Retrieved 10 September 2017. ^ "Gaston Ramirez: Real Betis hopeful of pushing through a deal for Middlesbrough playmaker". Gazette Live. 25 July 2017. Retrieved 10 September 2017. ^ "Is there any way back for Gaston Ramirez at Garry Monk's new look Middlesbrough?". Gazette Live. 5 July 2017. Retrieved 10 September 2017. ^ "Garry Monk on Gaston Ramirez & Stewart Downing's future: 'You use pre-season to open doors'". Gazette Live. 14 July 2017. Retrieved 10 September 2017. ^ "To boo Gaston Ramirez or not to boo? Is it complicated for Middlesbrough fans?". Gazette Live. 31 July 2017. Retrieved 10 September 2017. ^ "Middlesbrough fans who booed Gaston Ramirez are guilty of double standards". Gazette Live. 1 August 2017. Retrieved 10 September 2017. ^ "Gaston Ramirez will leave a mixed Middlesbrough legacy – from the sublime to the ludicrous". Gazette Live. 26 July 2017. Retrieved 10 September 2017. ^ "Transferts : Gaston Ramirez (Middlesbrough) à la Sampdoria". L'Équipe. 4 August 2017. Retrieved 4 August 2017. ^ "Samp, ufficiale l'ingaggio di Ramirez Torna in Italia cinque anni dopo Bologna" (in Italian). La Gazzetta Dello Sport. 4 August 2017. Retrieved 10 September 2017. ^ "Gaston Ramirez: No bid for the Uruguayan – and no clause in his contract". Gazette Live. 14 January 2017. Retrieved 10 September 2017. ^ "Ex-Middlesbrough playmaker Gaston Ramirez gives first interview after linking up with new Sampdoria teammates". Gazette Live. 9 August 2017. Retrieved 10 September 2017. ^ "Sampdoria-Benevento 2–1: Quagliarella decide con una doppietta" (in Italian). La Gazzetta Dello Sport. 20 August 2017. Retrieved 10 September 2017. ^ Edwards, Daniel (8 October 2010). "Indonesia 1–7 Uruguay: Suarez & Cavani Goalfest Leads Uruguay To Second Half Thrashing". Goal.com. Retrieved 25 May 2015. ^ Hunter, Andy (26 July 2012). "London 2012: Luis Suárez inspires Uruguay comeback against UAE". The Guardian. Retrieved 25 May 2015. ^ "Oscar Tabárez dio a conocer la lista de convocados" (in Spanish). Ovacion Digital. 1 June 2013. Archived from the original on 6 October 2016. Retrieved 6 October 2016. ^ "Spain 2 Uruguay 0". BBC Sport. 17 June 2013. Retrieved 6 October 2016. ^ "Uruguay 8 Tahiti 0". BBC Sport. 23 June 2013. Retrieved 24 June 2013. ^ "World Cup 2014: Luis Suarez named in final Uruguay squad". BBC Sport. 31 May 2014. Retrieved 24 June 2014. ^ "Italy 0 Uruguay 1". BBC Sport. 24 June 2014. Retrieved 24 June 2014. ^ "Uruguay 3–1 Trinidad and Tobago: Cavani double inspires home side". Goal.com. 28 May 2016. Retrieved 6 October 2016. ^ "Barcelona's Luis Suarez heads up 23-man Uruguay squad". ESPN. 16 May 2016. Retrieved 6 October 2016. ^ "Torreira earns first Uruguayan call-up". Get Italian Football News. 4 March 2018. Retrieved 22 March 2018. ^ "Suarez backs Gaston to be a hit". Daily Echo. 1 December 2012. Retrieved 6 October 2016. ^ "Southampton transfer news: Ramirez more bothered with baby wipes than Bologna move". The Sun. 14 January 2016. Retrieved 6 October 2016. ^ "Un 10 en fe: Gastón Ramírez recarga energía para la Celeste" (in Spanish). Ovacion Digital. 29 June 2013. Archived from the original on 18 July 2013. Retrieved 6 October 2016. ^ Gastón Ramírez at Soccerway. Retrieved 11 October 2017. ^ "Games played by Gastón Ramírez in 2010/2011". Soccerbase. Centurycomm. Retrieved 6 December 2016. ^ "Games played by Gastón Ramírez in 2011/2012". Soccerbase. Centurycomm. Retrieved 6 December 2016. ^ "Games played by Gastón Ramírez in 2012/2013". Soccerbase. Centurycomm. Retrieved 6 December 2016. ^ "Games played by Gastón Ramírez in 2013/2014". Soccerbase. Centurycomm. Retrieved 6 December 2016. ^ a b "Games played by Gastón Ramírez in 2014/2015". Soccerbase. Centurycomm. Retrieved 6 December 2016. ^ a b "Games played by Gastón Ramírez in 2015/2016". Soccerbase. Centurycomm. Retrieved 6 December 2016. ^ "Games played by Gastón Ramírez in 2016/2017". Soccerbase. Centurycomm. Retrieved 5 April 2017. ^ "Ramirez, Gaston". National Football Teams. Benjamin Strack-Zimmerman. Retrieved 16 November 2016. Wikimedia Commons has media related to Gastón Ramírez. Gastón Ramírez profile at Middlesbrough F.C.